Google Cloud Connect is the new and easiest way to sync Microsoft Office to Google Docs, but it adds a huge bar right underneath the tool ribbon. Because of this, since release day users have already began complaining about the large amount of space that it takes up, and Google hasn’t added in a minimize feature yet. But, you can save up some space when you don’t need the Google Cloud Connect features by disabling it. It is quick, easy, and you don’t even have to reinstall it to get it working again. If you haven’t seen it in action yet, check out the screenshot below. On my laptop screen, the toolbar takes up approximately 36 pixels in height. On a 1366 x 768 maximum resolution that totals out to nearly 5% of the screen’s height, spent on something that I don’t ever need to see. (it automatically syncs whenever you Save the document) So I can definitely understand where the complaints are coming from, I mean –who would want to have a giant Google Docs ad splattered across their MS Office applications? Not using the cloud bar? Just turn it off! While a functional minimizing isn’t yet available, we can still disable Cloud Connect without installation. Since you probable don’t need to sync every document that you ever work on, or need to sync every single little change –this might work for you until Google updates Cloud Connect. Disabling it will remove the bar from sight, and if you want to enable it again that only takes a few seconds. Let’s get started. In a Microsoft Office program (I’m using Word), Click the File tab and Select Options. *Make sure the drop-menu is set to COM Add-ins, as it should be by default. The COM Add-Ins window should pop-up. Uncheck the Google Cloud Connect box and Click OK.
Now the Cloud Connect bar should no longer be visible in your Microsoft Office program. The only downside to this is that it completely shuts off the add-on, and so you can’t sync your documents while the cloud bar is disabled. But, if you want to use it again all you have to do is Recheck the box in Step 3 and it will be up and running; note that it only takes a few seconds and clicks to change this. Since it’s release last week, we’ve been testing out Google Cloud Connect for Microsoft Office. 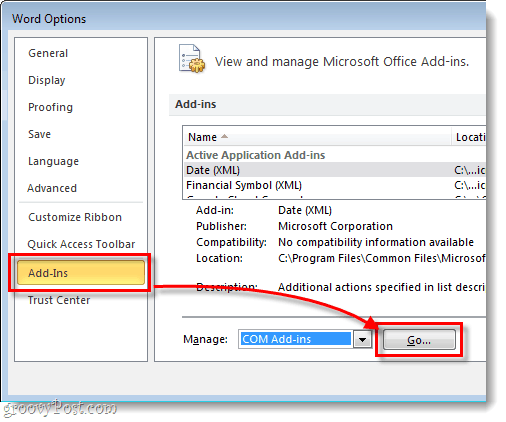 It has its pros and cons, but overall it is just one of many now-available Office sync tools. Yeah I installed this after reading about it and I find it annoying I can’t disable easily in each doc. I don’t like it sitting there by default. OMG thanks. That thing is so annoying. Outlook is a work tool. The last thing I need is for it to be distracting me with social media crap.